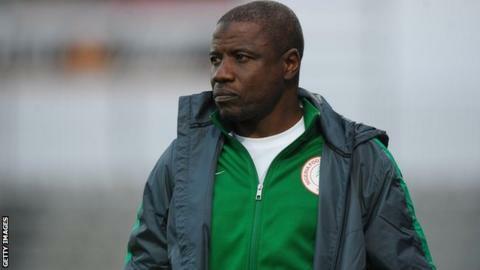 The Nigeria Football Federation (NFF) has banned coach Salisu Yusuf for a year and fined him US$5000. The sanctions were imposed on Yusuf, 56, following an NFF investigation into bribery allegations. He was caught on camera taking cash from men posing as football agents, who requested that two players be selected for a continental championship. The names of the players were not disclosed and Yusuf has denied any wrongdoing. He appeared before an NFF ethics committee in the capital Abuja on Thursday. The probe was prompted by footage captured by Ghanaian investigative journalist Anas Aremayaw Anas and handed to the BBC's Africa Eye investigation programme. The committee said the ban was from "all football-related activities at both national and international level" adding that "an appeal against the decision can be made to the NFF Appeals Committee". An NFF said in a statement "found as a fact from the documentary and video evidence before it, that he accepted the cash gift of $1,000. "[He] Offered by Tigers Player's Agency, an undercover reporter, purportedly interested in acting on behalf of Players Osas Okoro and Rabiu Ali, for their inclusion in the list of players for 2018 CHAN Competition in Morocco." He insisted at the time that the money was a gift and that the players were selected on merit and he is yet to say whether he will appeal the sanctions. "There is nothing in the allegation pointing to a demand for the money from the agents of the two principals. Rather, the agent only handed the money to me after expressing 'hope' that the principals would play in the Championship," he said in a right of reply. "Be that as it may, I did accept cash handed to me by one of the said football agents, which I later discovered, upon checking, to be $750 and not $1000." Yusuf was assistant to Gernot Rohr at the recent World Cup in Russia and led the Nigeria to the final of this year's Championship of African Nations (CHAN) in Morocco.